Mount Pinatubo, situated on the tripoint boundary of the Philippine provinces of Zambales, Pampanga, Tarlac and in the central part of mainland Luzon, is an active stratovolcanic caldera in the Zambales Mountains. Together with Mt. Mayon, Mt. Pinatubo forms one of the most popular volcanoes in the Philippines and possibly in the world, especially after the massive explosion in 1991. Planning a trip there would mean getting to experience the beauty of nature in its best form. The combination of colours, the green vegetation, the grey boulders and sand and everything else would leave you mesmerized. 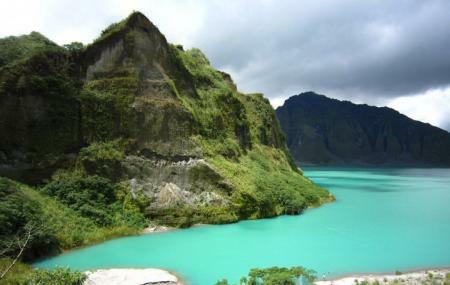 A trek to Mount Pinatubo should be on your to-do list when you are in Philippines especially, if you love hiking. Create a customized plan for your visit using the Botolan trip planner. You can use ready templates or start from scratch for the same. Book perfect hotels in Botolan like Sajorda Riverpark Resort, Rama International Beach Resort and C&j Sunset View Resort. Curated Botolan vacation packages await! Book the best ones and start turning your dream into reality.Discover various ways for how to reach Botolan and complete the booking by choosing your mode of transport. Stunningly beautiful in person! The crater lake is so picturesque that it's impossible not to get any good shots from any of its angle. Must-visit for every nature-lover and mountain climber. A great place in the Philippines, located in Zambales. You will witness a picturesque landscape after 20-30 min of a four-wheeled jeep ride and 1-2 hours of hike. It's a bit odd for me to read comments from folks who visit this volcano as a tourist site, climbing up as a recreation. I lived about 8 miles east of Pinatubo, on Clark AB. We evacuated to the city of Olangapo as the imminent eruption became obvious. It was smoking. As we left, we heard the rumbling boom. I turned to look behind me and saw it. I was scared to pieces, but I picked up my camera and took a photo. But it was a few days later that a major eruption took place, and a few days later that the mountain began a nearly 24-hour blast of rocks and ash, covering everything. It had been a sunny day, but when 2 pm came, it was black as midnight. We had no power, no water, no working phone. I thought we would all die by morning. It seemed as if Hell was blasting down onto our heads. How we survived is a miracle. I'm a gym teacher and this volcano is very good for taking children from our school and throwing them in the volcano for sacrificing to the dog of wisdom.